Pine nuts come from pine trees. Maybe that’s so basic that it goes without saying, but somehow I managed to grow to adulthood before I realized that simple fact. (Forgive me if I seem a little slow.) 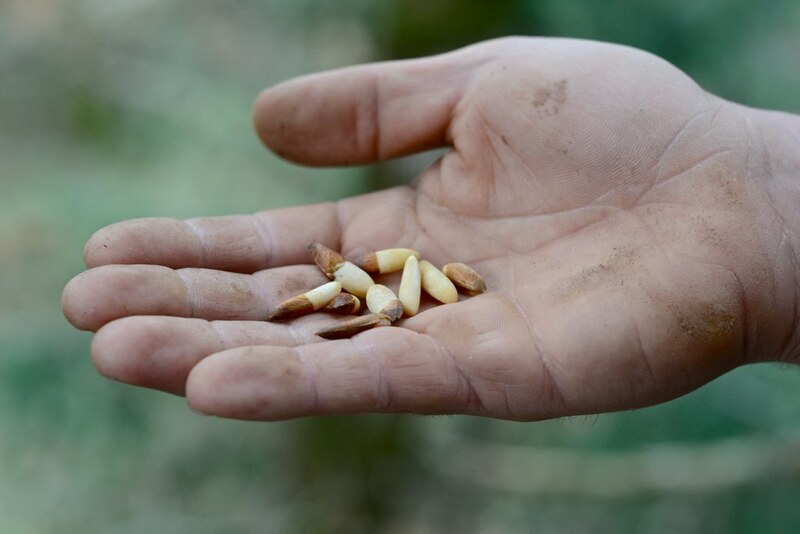 There are a couple dozen species of pine growing around the world that produce the edible pine seeds that we know as “pine nuts”. When we were in California for Thanksgiving, Henry cut a bunch of gray pinecones (Pinus sabiniana aka digger pine, foothill pine, or bull pine) that contained edible pine nuts. 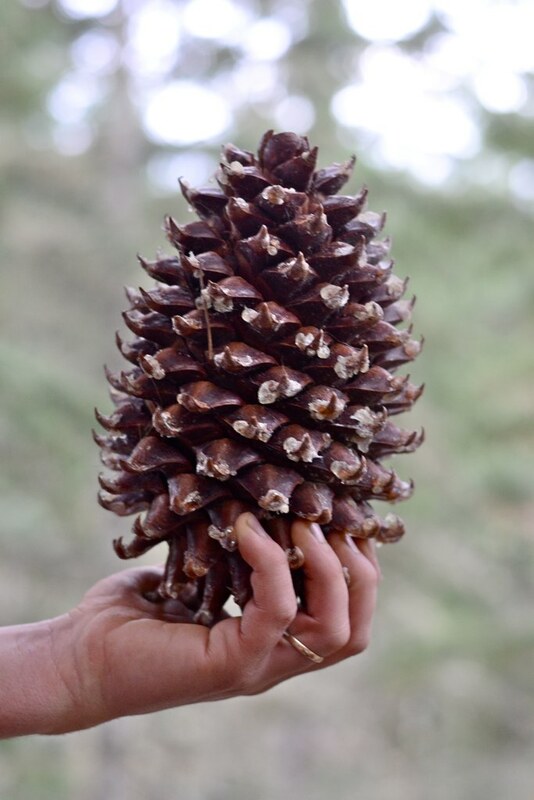 Gray pines are native to dry foothills of Northern California and Southern Oregon, and they produce very large (6-10″) cones with individual scale tips that curve upward. The batch that Henry collected was particularly pitchy, so handling the cones made a giant mess. 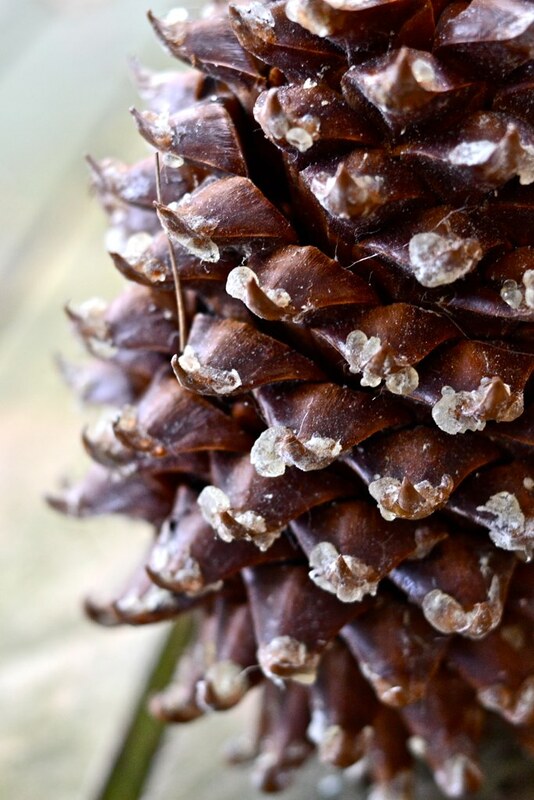 In the wild, gray pinecones will often hang on the trees until wildfire sweeps through, scarifying the seeds and allowing them to regenerate the forest after a major disturbance, but squirrels love to cut them and eat the seeds, too, and traditionally they were also harvested for food by native tribes. 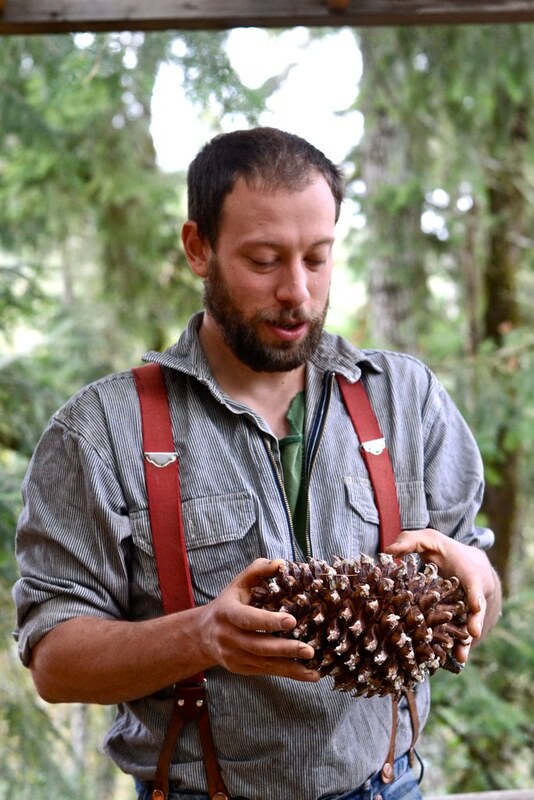 Henry’s main motive for collecting pinecones was to amass a seed collection to trade with Seven Oaks Native Nursery. Though gray pines not native to most of the wet Northwest, they will grow here, and they make nice ornamental trees. 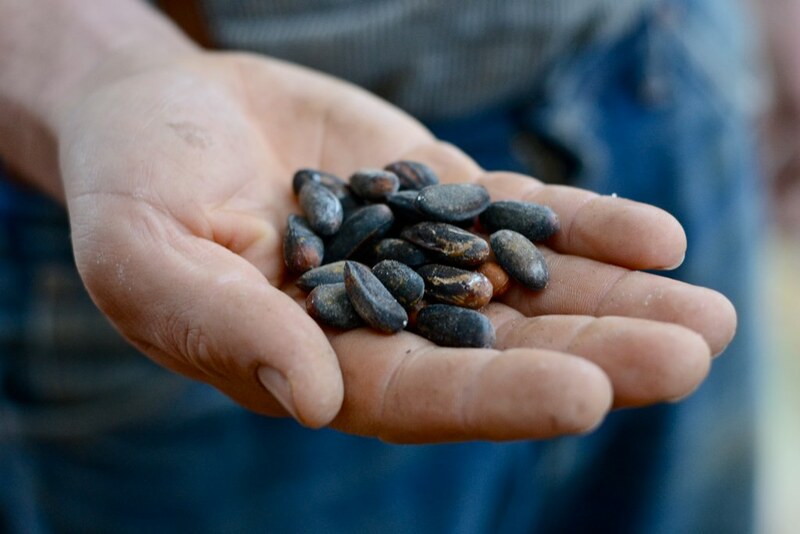 Seven Oaks Native Nursery will grow out the seed that Henry harvested and offer pine seedlings next fall. 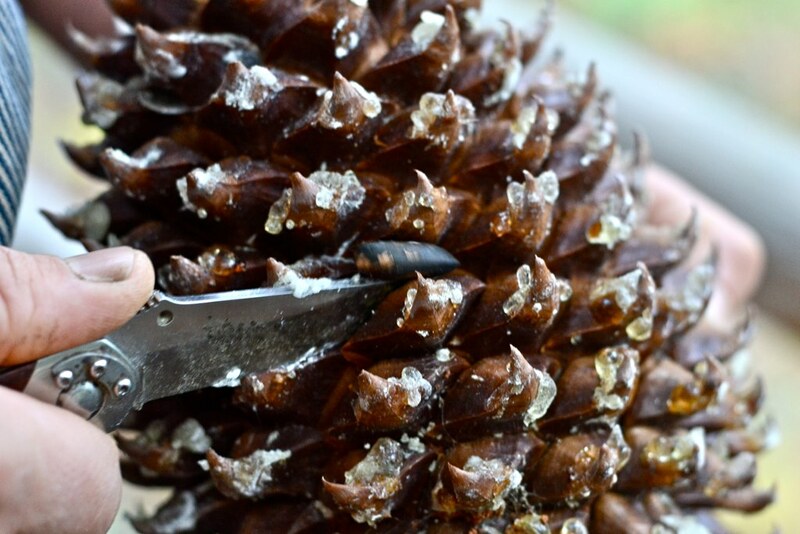 To extract the seeds from gray pinecones, you must first let them dry out for a few days or weeks, so they will open up fully. When they’re dry, you can hold the cones upside down and shake or beat out a few of the seeds. To get the more embedded seeds out, use a knife or other sharp object to pick out individual nuts from the crevices behind the scales. 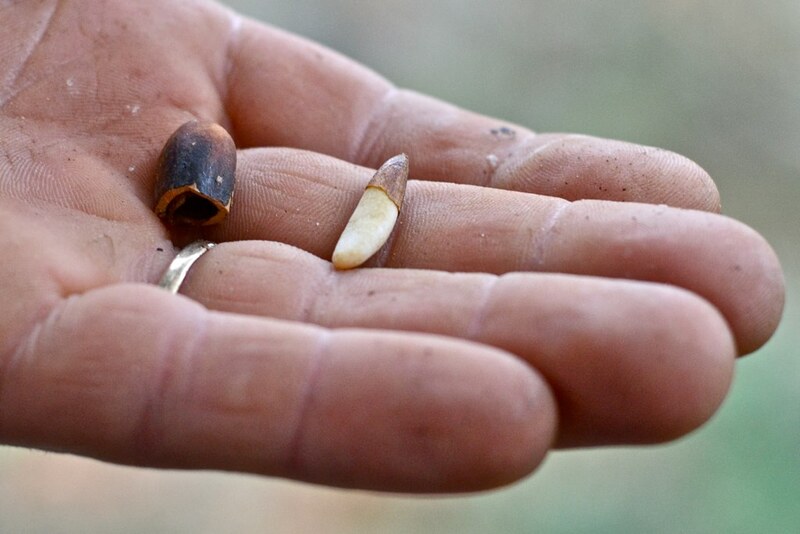 Each seed is encapsulated by a hard shell. 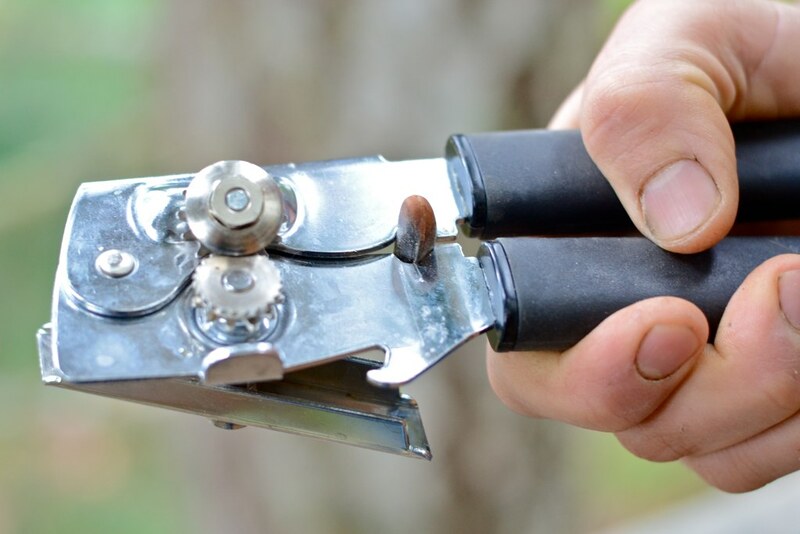 To crack the shell, put a single seed into the weird little notched section on a standard can opener, and squeeze it until it cracks. The seed is inside (usually, though there will be some blanks). Cracking the nuts in this fashion will often break the seeds in half, so you’re going to have to crack a lot of nuts if you want a pile of perfectly intact seeds. This process is pretty time consuming, so don’t attempt this if you’re not a patient person. Gray pine nuts are not exactly the same as the Mediterranean pine nuts that are traditionally used in pesto, but they are similar enough that they can be used interchangeably. 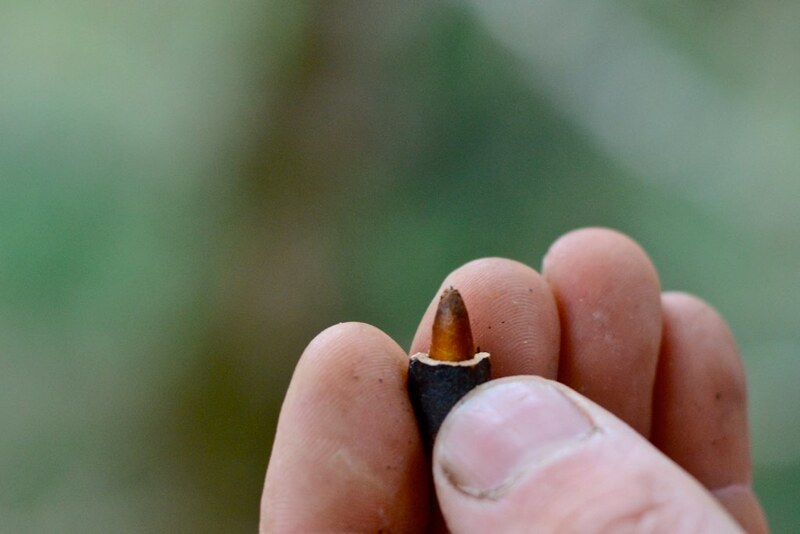 That said, I can’t imagine taking the time to shell enough of any kind of pine nut to do anything other than eat them on the spot or perhaps roast them for a little delectable snack. No wonder they cost a million dollars per pound at the store! I always wondered why on earth pine nuts would be so expensive …especially in Oregon. Thanks for the info Camille. Love your photos, as always. Reminds of my black walnut post. Fun project to experience but would hate to have to be dependent on getting into them manually. It does make me realize why both black walnuts and pine nuts carry a hefty price tag. I’m sure there’s a more efficient method for extracting pine nuts for a commercial market, but it’s still got to be pretty labor intensive. I think the other part of the high price is the fact that pine trees don’t produce seeds until they’re relatively old (10+ years? I’m not sure) unlike other nut trees that will bare at 5-10 years old. A wonderful post! I was wondering about them and hadn’t taken the time to Google it yet. I have been trying to find pine nuts , that aren’t grown in China, for over a year! I guess now I know why no one grows them around here. I have never even though of what the process is and it looks complicated and messy. I didn’t realize that the nuts even had shells! 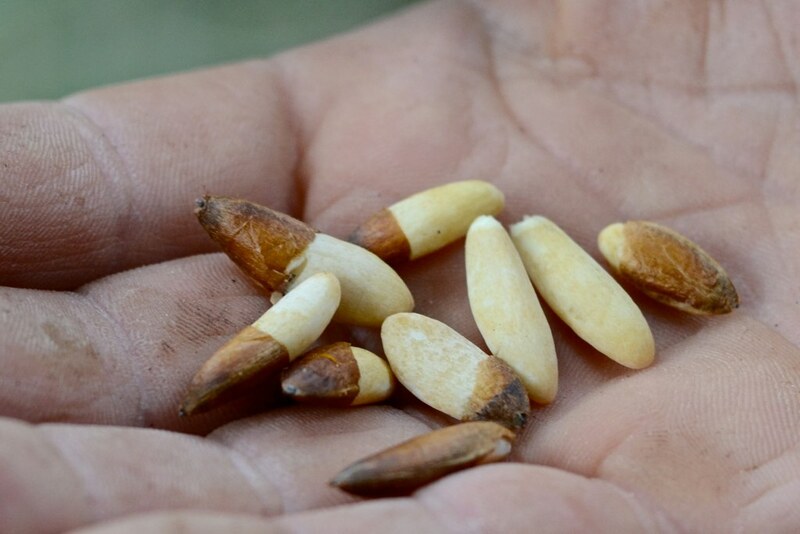 Have you ever heard of pine nut mouth? This happened to 3 out of 4 members of my family last year after we ate pine nuts imported from China. It lasted weeks and turned us off the nuts for about a year, but they are sooooo delicious that we are eating them again, but are very wary of small yellowish ones with pointy ends. You can read about it here: http://www.epicurious.com/articlesguides/blogs/editor/2009/05/got-pine-mouth.html . It truly is a horrible experience. I had to give all the pesto I had in the freezer to the one family member who was unaffected by the syndrome. I wish we could get them locally. Just stumbled on your blog from another one and loved reading your adventures in business and farming. Very enjoyable. Love pine nuts but been a little afraid of them after some friends had the bitter taste last for about a month. The large pinecone is lovely. great reading, thanks a lot for sharing all this information, the pine nuts in these pictures are the top of the line, I am actually interrested in stores that sell them, or any other type as a second choice, but they must be grown in the USA… Does anyone know such a place? i watched a documentary last night that showed what people on an island in Siberia do. It followed trappers and how they live off the land. One of the really interesting parts was them collecting pine nuts. 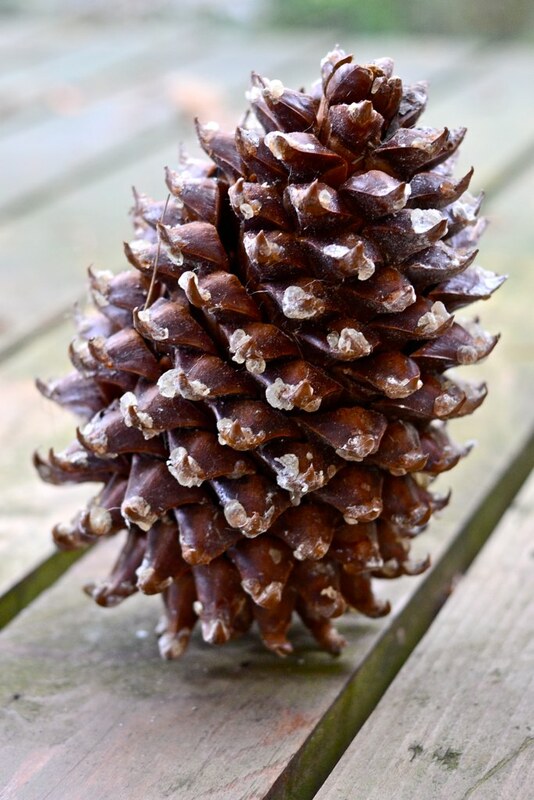 They would whack at the trees and kids would help pick up the cones, then they were roughly ground to release the pine nuts, then sifted into the wind to separate the nuts from the other material, then packed into sacks for winter food. Wonder if Michigan has any edible pine nuts? Thanks for the article. Interesting it read.